As the Supreme Court prepares to rule on the legality of private corporations denying women reproductive autonomy (because it says in the Bible that every pro-life human has a God-given right to trample upon the basic liberties of others), the National Coalition of American Nuns (NCAN) have announced that they support the Affordable Care Act's contraception coverage. Yes! 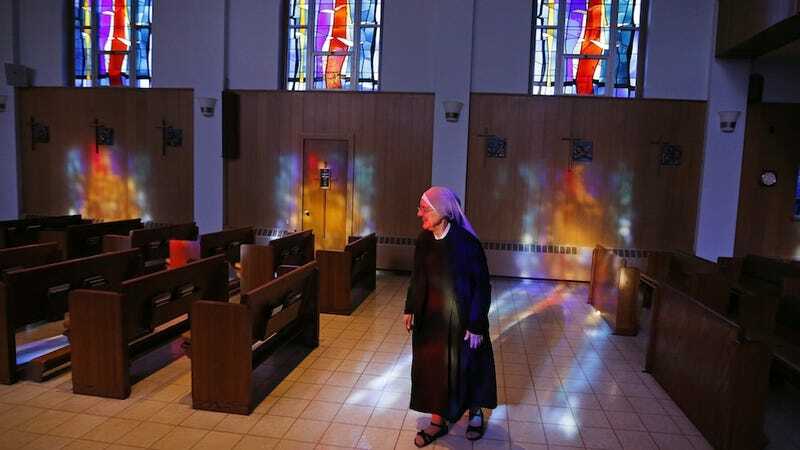 This comes in stark contrast to another group of nuns, The Little Sisters of the Poor Home for the Aged in Colorado, who filed an emergency petition before the Supreme Court in the end of 2013. The Little Sisters of the Poor claimed that Obama's birth control compromise — which mandates that non-profits opposed to contraception on religious grounds can have a third party administrator cover it instead — still violated their religious freedom. NCAN is dismayed that the Little Sisters of the Poor, the University of Notre Dame and other Catholic organizations are challenging the Affordable Care Act. Spurred on by the United States Conference of Catholic Bishops these organizations are attempting to hold hostage all women by refusing insurance to them for contraceptives. "It isn't 'faith and freedom' when reproductive autonomy isn't extended by the Catholic Church to women," Sister Donna Quinn, head of NCAN, told Religion Dispatches. "It isn't freedom when a woman can be held hostage by the owner of a business." The nuns have also started an online petition, which has almost reached its goal of 4,000 signatures. "We want to make clear that the sin is not a person using birth control. The sin is denying women the right and the means to plan their families," the petition declares. "Indeed, it is precisely because life is sacred that we support the intentional and moral use of contraception." It goes on, "We know that religious freedom means that each person has the right to exercise their own religious beliefs; religious freedom cannot mean that an individual or a corporation gets to impose their religious beliefs on their employees." Yes, exactly. There is no such thing as a "religious freedom" to force someone else to abide by your oppressive and antiquated logic. Bravo, NCAN.